North Korea Rocket Rundown: How Far Can They Fly? North Korea apparently moved a medium-range missile into firing position Thursday (April 11), further ramping up a campaign of threats against South Korea, the United States and their allies. Angered by economic sanctions imposed by the United Nations after a nuclear-weapons test in February, Pyongyang has been doing much saber-rattling lately. The regime has threatened to turn major American cities into "seas of fire" and announced last week that it had authorized a potential nuclear strike against the United States. North Korean missile technology traces its origins to Soviet Scuds, which likely came into the country via Egypt in the 1970s. Pyongyang soon developed its own versions of the Scud, which it calls the Hwasong-5 and Hwasong-6. These missiles can fly a few hundred miles, putting most of South Korea within reach. The regime also has a souped-up variant called the Nodong, which experts believe has a range of 620 miles to 800 miles (1,000 to 1,300 kilometers). "That's a problem, because they've tested it, and it can reach Japan," physicist and missile-technology expert David Wright, co-director of the Union of Concerned Scientists' Global Security Program, said of the Nodong. These shorter-range missiles have relatively poor accuracy, he added — perhaps 0.3 miles to 0.6 miles (0.5 to 1 km) for the Hwasong line and 1.8 miles to 2.5 miles (3 to 4 km) for the Nodong. "You're not talking about things that could attack military targets, but they could attack large things like cities," Wright told SPACE.com. North Korea has also developed longer-range missiles, including the 83-foot-tall (25 meters) Taepodong-1, which experts think is a two-stage missile with a Nodong first stage and a Hwasong-6 second stage. The Taepodong-1 has a range of perhaps 1,500 miles (2,500 km), though also with poor accuracy. The vehicle has flown once, in a modified space launch configuration that added a third stage. It blasted off in August 1998 carrying a small satellite but failed to deliver the craft to orbit, Western observers say. The next step was the even bigger Taepodong-2, whose maximum range is estimated to be from 3,000 miles to 5,400 miles (5,000 to 9,000 km). This vehicle's lone flight test also did not go well, with the missile exploding 40 seconds after liftoff in July 2006. The missile that Pyongyang moved into firing position Thursday is called the Taepodong-X, also known as the Musudan. Analysts think its range is around 2,000 miles (3,200 km), but it's tough to say because the Musudan has never been flight-tested. "There's no reason to actually consider them operational," Wright said. "There's no test data to say that they work." 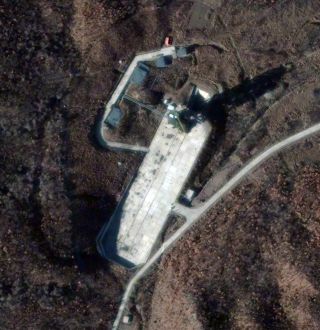 North Korea suffered two more satellite-launching failures after its initial 1998 attempt — first in 2009 with an advanced, three-stage variant of the Taepodong-2 called the Unha-2, then again in April 2012 with a rocket called the Unha-3. The regime finally broke through in December 2012 when another Unha-3 successfully delivered a satellite to orbit. While space launchers can be converted into ballistic missiles, the Unha-3 does not appear to represent a significant threat to the United States at the moment, Wright said. "The Unha is just not that powerful," he said. "If we try to imagine them putting a heavier warhead on it and flying it, you can maybe get 7,000 or 8,000 kilometers, but you're not getting really long trajectories that can hit much of the country."